Tara Varney: The Unicorn Theatre's Staged Reading of "Sexing Hitler"
The Unicorn Theatre's Staged Reading of "Sexing Hitler"
The year is 1941. German soldiers in occupied territories are contracting syphilis from prostitutes in astounding numbers. The disease threatens the stability of the Third Reich. To solve the problem, Adolf Hitler orders the creation of inflatable pleasure dolls that the soldiers can carry in their packs to satisfy their urges. Some businesses did not particularly want us to put our poster up. Go figure. Bryan and I wrote Sexing Hitler to present at the KC Fringe Festival in 2012. When we started gathering the team to work on it, we knew we were taking a gamble. It was based on a great historical tidbit, but what we were planning was new ground for us. First, we asked our good friend and previous cast member, dancer/choreographer Amy Hurrelbrink, if she thought that it would be possible to tell the story of various relationships/sexual fantasies solely through dance. She answered, "Ummm... I don't know. Let's try it." The scantily-dressed one. That's Doll Amy in action. Then I thought, Wait. Does it make sense to create original choreography, for an original play, and cram it into previously-recorded music? No, no, it does not. Knowing the style we were going for, I approached Alacartoona, a local band with a fantastic pseudo-German cabaret style. Not everyone was available for a project that Bryan and I couldn't really describe anyway, and I'd just barely met them to begin with, but Christian Hankel and Kyle Dahlquist decided to jump in. Andy Garrison, as Himmler, talks to Christian Hankel, as one of the many experts of eugenics of the time, with musical accompaniment by Kyle Dahlquist, Richard Walker, and Sergio Moreno. And their drinks. At the same time, we were putting the cast together. We wrote the script with the voices of Marcie Ramirez and Parry Luellen, both beautiful and giving actors, in our heads. We knew them to be reliable, supportive, challenging-in-a-good-way, and ready for just about anything. Then, Andy Garrison, an actor and acting teacher, whom we knew and were friendly with, and had seen perform, but had never actually worked with before. Previously, though, he'd been fairly brutally honest about another play of ours that didn't quite work for him, and we so appreciated that he took that risk. Okay, great, but we needed someone to play the Soldier. This turned out to be really, really hard. We needed someone who could play several different characters, and dance. Dance well. And be available. We auditioned so many people, but none of them were the right one. I contacted an actor/dancer that Amy and I had worked with a few years before, Eric Tedder. Turns out, he has just gotten back into the country, from shooting a movie in Hong Kong, and was looking for a project. I auditioned him. He was everything we'd wanted. And more. I'd like to introduce myself: I am your dream come true. Bryan and I had written the script, but right before the first read-through, he suggested that we not give the cast the climactic scene. If this was to be a true collaboration, he said, we would let the team come up with the ending. I was scared, but he was right. Ultimately, the team came up with a much, much stronger ending than the one we wrote. 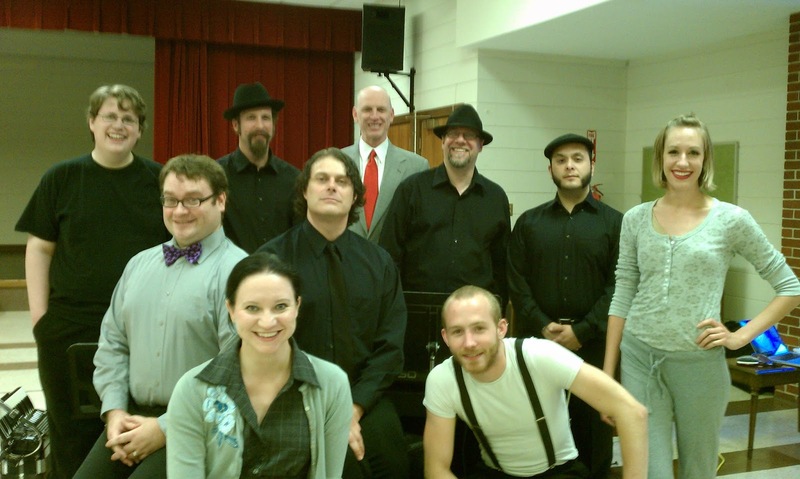 From left: Andy Garrison, Amy Hurrelbrink, Eric Tedder, Marcie Ramirez, Parry Luellen, Kyle Dahlquist. The first read-through was stressful for me, because hell, I didn't know what we were getting into. It turned out that Christian and Andy both knew a thing or two about WWII, and they were asking questions that made me nervous, because even after all of my research on this particular topic, they knew more about the war overall. Ohgod, ohgod, they know I'm a fraud. I don't know what I'm doing. They're going to quit, and this will never happen, and I'll be exposed as the amateur I am, and my career (what there is of it) will be destroyed, because I'm stupid and talentless and misguided and an impostor. Christian was writing music, and came to me to say that he needed more musicians. I got scared, because of all the mouths to feed: the smaller the team, the more money we could pay each of them. More to the point, we had a pretty solid collaboration going already, and I was worried about messing that up by adding people that I'd never met before. Sergio Moreno, percussion, and Richard Walker, keyboards, joined us. They were a perfect addition. Along with stage manager, Ryan Puffer, and the lighting designer, Shane Rowse - who made it better what I was even hoping for, while still admonishing me for costuming everyone "in aggressively gray-scale" - we embarked on what was to be probably the most challenging and beautifully collaborative artistic experiences of my life. Fortunately, for everyone else on the team, too. I love all of these people. So hard. We are fortunate that Sexing Hitler may still have another life. The Unicorn Theatre, here in Kansas City, is presenting a staged reading of the freshly-expanded-into-a-full-length play, with about 30 minutes of new material, this Sunday at 7:30pm. I'm very excited, very honored, and kind of scared. It's not only a brand-new script, it's also a brand-new creative team. The original production is so very, very close to me. Those people. That experience. The playwright/entrepreneur in me is beside myself with enthusiasm for this possibility of national exposure, but I'm also selfishly clinging to the memory of what it was. Of course it will be different. It should be different. I'm afraid that, if I go to rehearsals (which Bryan and I have been invited to), I will try to make it was it once was, not let it grow into what it could be. But I need to let it go. I need to send it off into the world and see how it fares for itself. Join us. It'll be great. I know it.